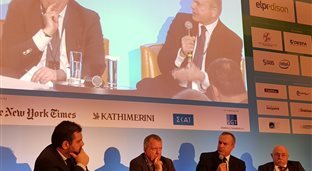 For another consequent year, ELPEDISON was the Headline Sponsor of Athens Energy Forum, which took place on the 28th & 29th of January, at the Grand Hyatt Athens. The Forum covered topics related to the Regional Geopolitical Perspectives, Privatization, the Cyprus Energy Outlook, the transformation of energy, the Renewable Energy Sources & Energy Efficiency as well as the Climate Change and sustainable goals. ELPEDISON’s Chairman, Mr. Andrea Testi, dynamically participated at the panel of the 2nd day which was dedicated to “The Domestic and Regional Power & Electricity Market Dynamics". He mainly addressed the decarbonization issue of the power generation in Greece, leveraging on his experience from foreign markets, such as the Italian and the French one. He also actively responded to the respective Q&As session, tackling issues related to NOME and the transition to the Target Model.